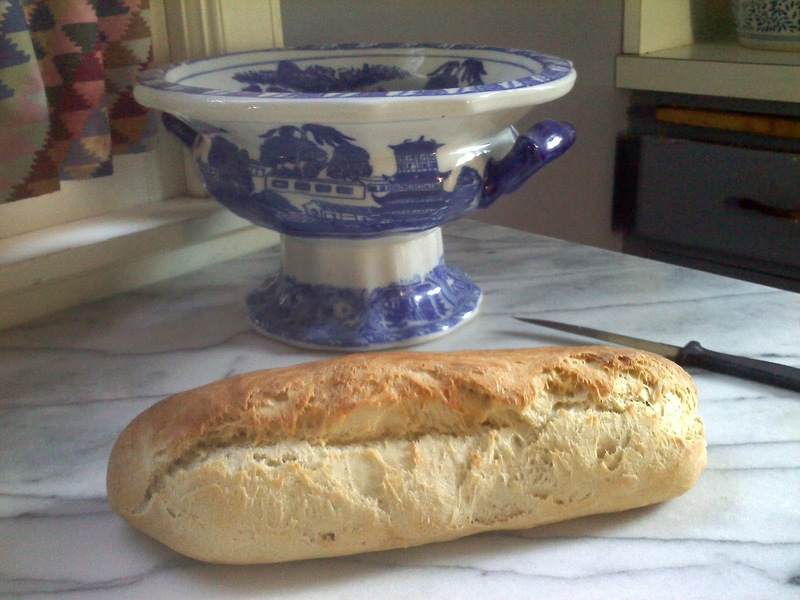 This is my basic French Bread recipe. I usually make a batch of this every few days, divide it (typically) into quarters, and get 4 small loaves out of it. Combine the dry ingredients, then add 1 cup of the water. Knead together the ingredients and add more water as needed. When combined, knead the dough for a few minutes, and then place it in an airtight container in the fridge overnight; OR, if you want bread immediately, let it sit out for about 40 minutes. Divide the bread into quarters. Shape loaves. (At this point I usually put the spare loaves into the freezer or refrigerator depending how long I expect it will take me to use them up.) Preheat the oven to 400 F or 220 C.
Put the dough onto a greased cookie sheet or a piece of tinfoil, and bake it for about 17 to 20 minutes in the oven. The loaf will be finished if it sounds hollow when tapped.